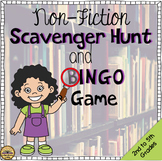 Send students on a Non-Fiction Scavenger Hunt to provide them with exposure to Nonfiction text features. I have students work with partners to explore a pre-selected Nonfiction book to find and utilize features within the text. Another great Scavenger Hunt that work with all Non Fiction stories. I wanted a document that would review all the target skills learned throughout the year and this is what I created. It works great and I have been using it for two year now! Enjoy! Check out my Fiction and Biography ones! Types of Nonfiction Scavenger Hunt! Use this scavenger hunt with your students to familiarize them with your nonfiction classroom library. Give students a nonfiction text and this worksheet. 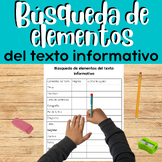 The students will use the text to find different text features. They will write down the page number where they found the feature and how the feature helps them understand the text. What a great tool to have the students use to allow them to look for all the different features of a Non fiction book. This is a great item for students to have in order to fully understand how a nonfiction book is different from a fiction book. A scavenger hunt for non-fiction text features. The text features listed are for beginners or scaffold instruction. Once mastered, students can move on to more complex text features to help in their understanding on nonfiction texts. As an introduction to the nonfiction unit, I take my students to the library where they can find books in the nonfiction section. I make sure they get books from every category and then require them to create a reading list for that marking period. Students use newspapers to locate, identify, cut and glue types of grammar (proper nouns, plural nouns, contractions, possessive nouns, etc) and nonfiction text features (heading, headline, table of contents, captions, diagrams, maps, etc). Great center activity. Nonfiction graphic organizer with additional reading skills embedded to help improve overall reading comprehension.